Milan doesn’t usually feature too highly on people’s ‘must visit’ lists. It’s an okay city, a financial powerhouse, but let’s face it, it’s no Florence or Rome. But, that doesn’t mean it’s completely without charm. Circumstances have lead to us taking shelter here for a few months now and I’ve been desperately hunting for things I like about the city the whole time. Finally, I think I may have found just about enough… So, here are my top five things to see and do in Milan. The Duomo – I admit that this is no insiders tip, everyone knows about the Duomo. But, it is a genuinely breathtaking building. And what’s more, you can go up it. You squeeze into the world’s tiniest payment booth, hand over seven euros and then climb a staircase that’s so narrow it makes the payment booth look like the inside of, well, the Duomo. You’ll certainly have the opportunity to get ‘friendly’ with anyone coming the other way, it’s a pervert’s paradise (apparently. A friend told me. Erm…). But once you make it to the top, all that effort becomes worthwhile. You can wander freely around the roof, among the spires, looking down at the streets below. It is quite incredible. And if you’re lucky with the weather, you can see across the whole of Milan, to the mountains beyond. Brera – Just to the north of the Duomo is an area called Brera. It’s all cobbled streets, antique shops, art galleries and welcoming restaurants. Wandering aimlessly around the narrow streets you can almost forget you’re in one of Europe’s busiest cities. Stop off for a Cotoletta alla Milanese or a nice plate of risotto washed down with a glass of wine (from the Langhe of course) and the experience is complete. Navigli – To the south-west of the centre is Navigli. This is where the achingly cool people spend their free time (or all their time, cool people don’t have jobs…). A canal runs through the middle and both sides are crammed with great little restaurants and bars. On the last Sunday of every month a huge antiques market lines the banks and the cool people sit outside the many bars soaking up the sun, drinking their craft beers and looking, well, cool. Trams – I don’t know why, but I love Milan’s vintage trams. If I’m driving, I hate them. They terrify me. But walking around seeing a bright yellow 1950s tram trundle by is one of my favourite things about the city. Line 1 is the best for seeing the old ones. Or maybe you could just go to San Francisco, they’ve bought a few and you occasionally see them heading up and down the hills, still replete with Italian signs and adverts. Go skiing – There can’t be too many cities so well placed for trips to the mountains. In two hours you can be ripping it up in the resorts of Monte Rosa – Champoluc, Gressoney and Alagna – or you can head north to places like Madesimo, or further into Switzerland. Even the Dolomites aren’t that far… Closer to the city, a tiny mountain called Mottarone offers enough skiing to keep most people happy for a day. Sandwiched between Lago di Maggiore and Lago d’Orta, directly above the town of Stresa, it’s only 1,500 metres high and has just 21 runs, but the 360 degree views are breathtaking, the restaurants are cheap and cosy and the slopes are empty. And the best thing? It’s just 45 minutes from the city. You can get a cable car up from Stresa; the views on the way up are ridiculous, but so is the place the cable car dumps you… miles way from any other working lifts or places you can buy a lift ticket. So you’re best off driving up from either Stresa or Orta, but bear in mind that the Stresa side is a toll road. Haha Richard, I love the title of this post. 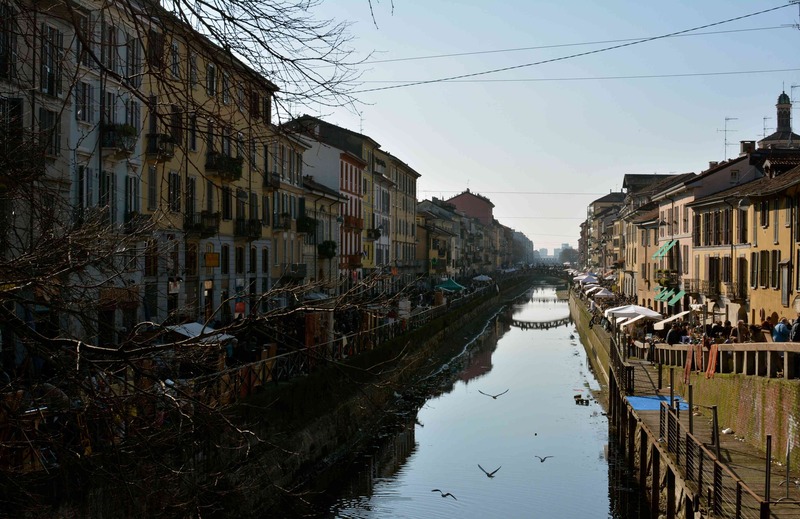 We’ve been living in Milan for the past 6 months, and like you, we’ve been surprised by some of the ‘hidden’ gems that Milan offers. I enjoy getting lost in the Brera as there’s always something new to discover and we’ve been converted to the custom of aperitivo, especially at the bars along via Porta Ticenese. Yes, the longer we stay the more we enjoy it, although I don’t think I’ll ever get used to the weather. Hi Jenny, thanks for your comment. I’ve just started following your blog and am already enjoying have a good read through! I think there is a lot more to Milan than people expect. It just takes a while to find it… You’re right about the weather though. Aside from the odd nice day, the past couple of months have been pretty horrific haven’t they! Just reading a book called ‘Head over Heel’ by Chris Harrison (nice little read!). He lived in Milan for a short while too, and said the winter weather was awful, the driving very scary, but the risotto was wonderful 🙂 swings and roundabouts…. I love Milan. It has the most stylish shops and fashion in the world. 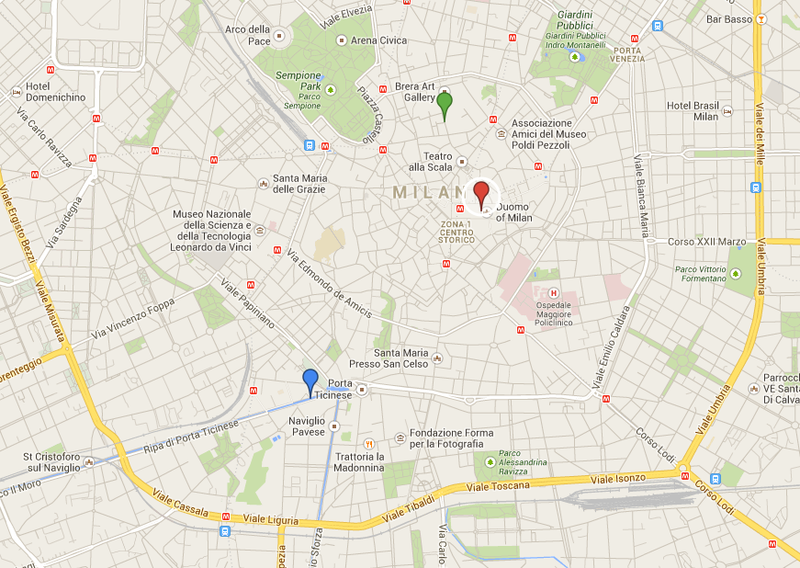 Brera is a beautiful district…I can wander there for hours. It has wonderful bars and restaurants and some if the most elegant people to be found anywhere. There are many lovely districts in Milan. I’ve been working in the city for a long time and my favorite area is Sant’Ambrogio. The church (Sant’Ambrogio) is of course great BUT there’s a smaller church to visit in Corso Magenta: San Maurizio’s church often goes unnoticed but it’s a jewel. Possibly the most beautiful in the Milan. Another area that I really like are the surroundings of Porta Genova, in particular via Tortona and via Savona. Hi Lola, thanks so much for the advice, I’ll have to check those areas out. I’m determined to get to know the best of the city while we’re here! I love Milan. I spent a few weekends there when my brother-in law lived there – it’s a fascinating place. There were women selling shoals outside the Duomo because tourists can’t go in there wearing shorts (providing me with the possibility of seeing my husband wearing a skirt). I recognized that canal photo instantly – I got lost and ended up driving along it through pedestrians one evening. Very embarrassing. Driving in Milan requires huge quantities of self confidence, or similar quantities of Xanax. Shoals? Shawls! shoals of shawls! You must be kidding. I had been asking “scusi scusi” for the last hour and driving around in circles; I was inches from pushing the car into the canal and finishing the journey on foot. Milan is a shopping city, “window” if you can not afford it, thus to your list add the via Monte Napoeone area, where there are probably the best shops in Italy (competing with Mercerie in Venice, central Florence, Piazza di Spagna/via Condotti Rome). Then the whole area around Duomo, Galleria, corso Vittorio Emanuele, not far from via Monte Napoleaone. There the Rinascente, the Harrods/Selfridges of Milan is worth visiting. Different. Thanks Bimbo. Shopping’s not really my thing, but fortunately I know someone that does enjoy it. I’ll be hiding your comment from her!! 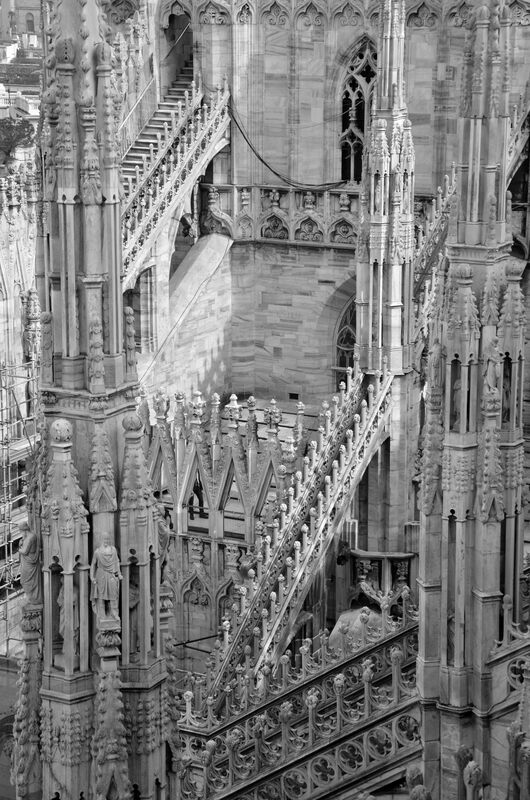 I think your right, you have to stay a while…I loved the Duomo, especially on the roof but other than that it kinda just feels like another European city to me. I did have a yummy coffee there though and that is something! Yeah, I think maybe it’s a place to live rather than visit. You have to spend a long time there to really appreciate it. It doesn’t have the big sights, or as much amazing architecture as a lot of other cities, but it does have interesting neighbourhoods, I think that’s what it’s all about. And the coffee, obviously! Great write up on a city that people overlook…and shouldn’t! No, it isn’t bad at all (especially when shopping and eating out is involved). I like my pasta and all, but for a change of taste, Milan is the closest city for getting my ethnic food fix. Hi I’ve just arrived in Milan, hope to be here for a year – study visa, so I chose Milan as the best place to find some work. I eventually want to live in the Langhe too, but for this year I’ll explore Milan and see what happens! So far so good, and I’ve always quite liked it. Next? Chissa! Hi Alison, I’m sure you’ll love it. For me it’s just somewhere that needs to be given a bit of a time. Spending a year here I’m sure you’ll get to know it pretty well. Send me some good recommendations when you have them!! One of my favorite things was grabbing a panino and sitting in Piazza Duomo and watching all the beautiful people walk by 🙂 So stylish and posh! Awesome, thanks, I’ll check those out! I should have mentioned the people watching, you’re right, it really is great for that! But did you find him?? If you did, I hope you cut that weird rats tail thing of his off! No worries, maybe give it another try… it seems, judging from the comments here, that people who know it well love it, so there is obviously a lot more to it than meets the eye! Thanks for this post! The only reason we put Milan on our itinerary was to see the mindblowing Duomo( I’m OBSESSED with cathedrals. I’m sure I’ll kill a whole day in there with my camera) and a Pearl Jam concert! We’ll be renting a jazz musician’s apartment In the Porta Romana area for a couple nights. Do you know anything about that area? I look forward to checking out #s 2, 3 and 4!!! (I had to look up “tram trundle”!) and, of course, people watching. My husband and I are god at that. If you come up with any more gems in the next couple of months let me/us know!!! I’m sure you’ll love it… even with just the Duomo and Pearl Jam on your itinerary, that’s a pretty good itinerary!! I don’t know Porto Romana I’m afraid, looks like it’s not far from Navigli though. From all the comments I’ve had the general opinion seems to be that Milan is a place that takes a big of getting used to. I assume you’re staying through AirBnB, so that’s the perfect start, you already feel like a bit more of a local by staying in a proper apartment, in a proper area. Maybe we’ll include that area in our next city trip anyway so I can let you know what it’s like! I love the trams too!!!! And was scared of them too when I was driving! Ha, ha, ha..the EXACT same sentiment! We live near Varese now, but when we lived in Milano…we loved our “33.” About Milan….well…I never cared for it much until I started living there. I guess I found it an easy city to live in relative to Rome. Easy to get around, easy for parking (again…relative to Rome). It has its moments. I know at least one person in this house who’d go just for the trams. The rest sounds cool, though. It’s always seemed like a very glamorous city to me because it always ends up on signs next to cities like “New York” and “Shanghai” or whatever but apparently I know very little about it because you’ve enlightened me considerably. Worse places to be sheltering in, by the sounds. Yeah, the trams are very cool! And you’re right, it’s always, New York, Paris, London, Milan… so I guess it must be high on someone’s agenda! Glamour’s not really my thing (hard to believe, I know…) but I guess it can be a pretty stylish place. Certainly good for people watching. Thanks for all the great sights to be found in Milan! ← Congratulations, it’s an Italian!